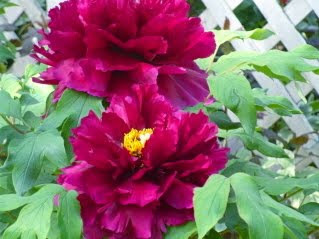 One of the most glorious sights at our Asheville bed and breakfast gardens...and there are many...is the blooming of Tree Peonies "paeonia suffruticosa". 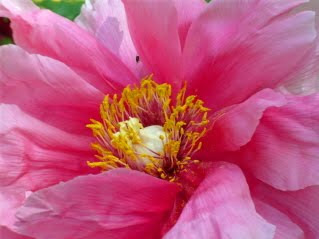 Not to be confused with the other garden peonies that we know and love, "paeonia lactifolia" that will bloom in May, Tree Peonies are a woody shrub that produces short-lived but huge, showy, multi-layered blooms that are open each year the end of April. 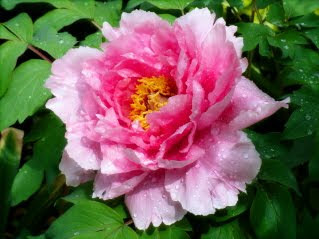 Originating in the Far East, you may have seen these Tree Peonies blossoms in Chinese paintings and as designs on drapery, upholstery or dress fabrics. Although the actual flowers last only a few precious days, and may even be cut short in our Asheville bed and breakfast gardens by a strong rain, having the "real thing" is a stunning addition to your enjoyment in the Spring gardens at Abbington Green Bed & Breakfast Inn. So take a look at the "show" they are putting on today.